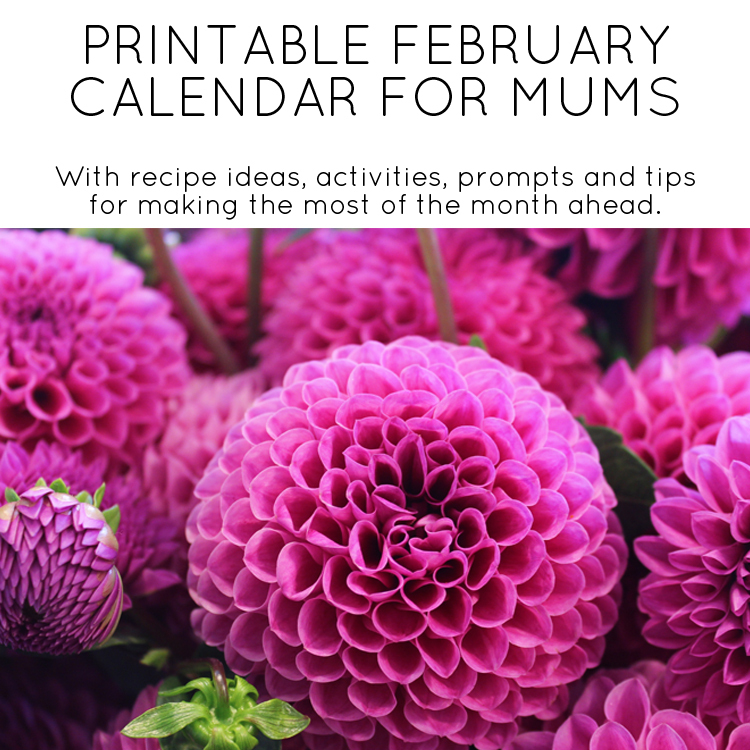 Each month we bring you an A4 printable calendar for you to download and print to help you simplify and organise the month ahead. 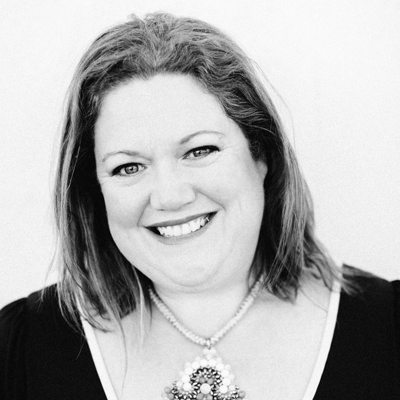 There’s room for adding your own activities plus loads of ideas to help you have the best month possible. Last month’s calendar is here. 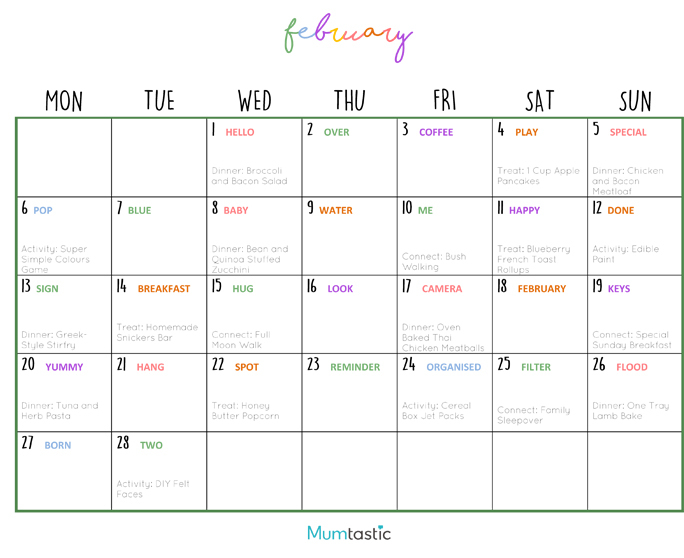 Your February 2017 printable calendar is packed with dinner ideas, fun activities and meaningful ways to connect with family and friends. 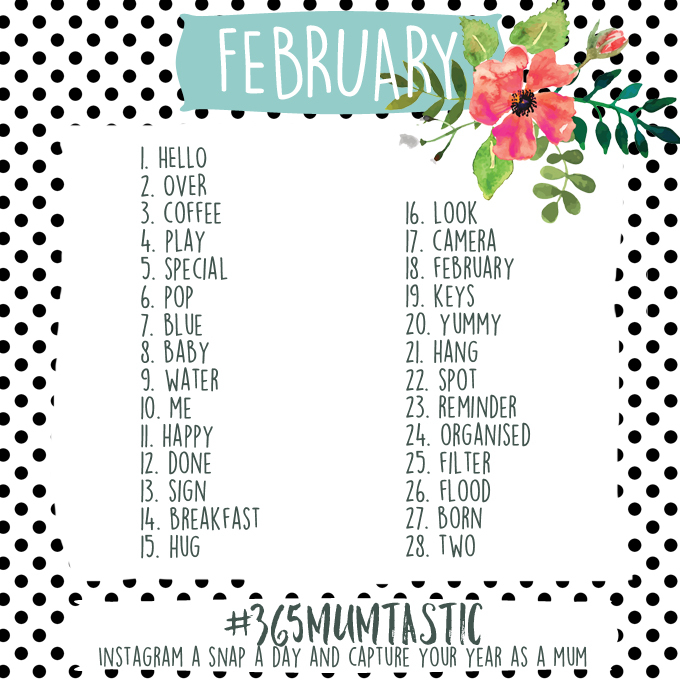 We’ve also included the daily prompts for the #365Mumtastic Instagram Community. Too easy! Broccoli and Bacon Salad: A delicious warm weather dinner that works as a main or a side. Chicken and Bacon Meatloaf: You’ll have leftover bacon after making the broccoli salad and this recipe is the perfect way to use it up. Black Bean Quinoa Stuffed Zucchini: A vegetarian hit at my place, you can substitute kidney beans if you can’t get your hands on black beans. Oven Baked Thai Chicken Meatballs: Add a rice, corn and capsicum salad and leftovers from this dinner can go straight into the lunch box. Tuna and Herb Pasta: Most kids will eat tuna so it’s always good to have a few new recipes up your sleeve. One Tray Lamb Bake: Add whatever veggies you have on hand to this one tray wonder dish. Greek-Style Vegetable Stirfry: Merge cultures with a stir fry featuring traditional Greek flavours. It’s goooood. Blueberry French Toast Roll Ups: These have got to be the perfect afternoon snack. Homemade Snickers Bars: There’s only one word to describe these: decadent. They are even better than the ‘real thing’. Honey Butter Popcorn: Put a tasty spin on a traditional favourite. I bought a popcorn popper from Target for $9 a couple of weeks ago. 1 Cup Apple Pancakes: These could not be easier to make. You can make them for breakfast, lunch boxes or afternoon tea. The Super-Simple Colours Game: Add some extra fun to your next playground visit. Make Some Edible Paint: So much fun for painting the breakfast toast before eating. Cereal Box Jet Packs: Up, up and away with this super cheap and cheerful craft idea. DIY Felt Faces: Hours of play with a few simple pieces. Use the Instagram #365Mumtastic daily prompts as inspiration for your child’s drawings: “What can I draw, Mum?” Try giving them the daily prompt – then take a photo of their creation for the Instagram community to see! Bush Walking: Taking the kids into the bush is so beneficial. We’ll show you how to do it safely and stress free. Full Moon Walk: Add a little extra to your bush walk by taking it during a full moon. Special Sunday Breakfast: Make some extra-yummy breakfast treats and enjoy a leisurely brunch outside together.